Here is this week’s prompt… Using the third definition, your piece must be exactly 33 words. This news does not satisfy me either. After three years, The Trifecta Writing Challenge comes to an end this month. The Brainchild of Lisa Harvey, TWC has been a solid weekly platform for writers to strut their stuff. Prompts always challenging and never boring, the number of writers submitting entries swelled, sometimes reaching 100. That’s a lot of stories. I don’t remember how I found TWC, but I’m glad I did. I had been writing 100 word stories based on a photo prompt for Friday Fictioneers, many of who write stories here, and I got up my courage to submit a story to TWC… the cruciverbalist… was my first. I learned so much about writing and gained new confidence by reading and writing at The Trifecta Challenge. And, not only that, but I’ve made some good friends. I’ve started submitting some stories at yeah write and still take part in FF. I have fond memories of my time at TWC and thank the editors for all their hard work. I’m sure we’ll meet again. When I told Ethel and Cheryl they were not happy. The dish, pictured above, actually existed… Thanksgiving 2009… My son-in-law Steve insisted on making it. I don’t know if he got the recipe from Ethel. I think he ate most of it. This weekend, writers, it’s up to you. We want you to choose a word and use it three times in your 33 words. However, it must be either a verb, noun or adjective and the form of the word cannot change, it must appear exactly the same three times. Please highlight your chosen word in your piece before linking up. He had been at odds with his companion for some time now. After all, here she sits; eating his food, drinking his wine and watching his TV. Isn’t she the one hired to take care of him? Not being able to speak has hampered his ability to express his concern. When family visits, he tries to convey his dismay with his eyes, like they do in the movies, but to no avail. They just don’t get it. What’s worse, they think she is doing this wonderful job tending to his needs. The accident had left him in such sorry state. He guessed he should feel lucky, since without her he would die. Actually, death might be preferable to another episode of Jerry or Maury. He had forgotten about Judge Judy, but at 4 o’clock he will be reminded. UNPUBLISHED TRIFEXTRA GEM UNEARTHED! The Wall of Water! Walter took the stage to perform the deadliest feat of his career… The Wall of Water! The audience gasped as he started to drown, but the ring of his bedside alarm saved him. Yesterday I came across this story written last July. I was in the mountains and was not able to publish by the Trifextra deadline due to spotty internet. I was ticked, since I thought this was a good one. I decided to let it see the light of day and add to The Trifectra Writing Challenge, even thought it is a little late. Maybe they won’t notice it’s not following this week’s prompt. The illustration is a still from the 1953 film ‘Houdini’, starring Tony Curtis and Janet Leigh. Cheryl had taken her friend to Damen and North Streets under the El, a new restaurant they had been wanting to try. Cheryl could tell Ethel was upset, she had been silent on the way, most unlike Ethel. As curious as she was, she would bite her tongue and wait for her friend to explain why she had to ruin a perfectly good evening of watching Survivor. Ethel knew it was her favorite show, why couldn’t she get arrested on a different day. 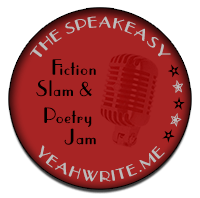 I’d read stories from Speakeasy prompts by some writers I like. I thought I’d give it a try. Here is where to find The Speakeasy! Trifextra #93: DON’T WORRY BE HAPPY! This was a card my sister Mariya gave me many years ago. I may not have done the Trifextra Prompt correctly, but it’s the first thing I thought of… and I have always found comfort in his words. Meher Baba created controversy in the early 20th Century saying he was God. It is accepted by many that we all are and have not yet learned how to live it. Buddhist cosmology tells of Trāyastriṃśa, or the Heaven of Thirty-Three gods, which rule over the human realm. This weekend we’re asking for exactly 33 of your own words about a god of your own devising that shares heaven with the other thirty-two gods. Make it yours and have fun with it. – See more at: http://www.trifectawritingchallenge.com/2013/11/trifextra-week-ninety-three.html? Trifextra: Week Eighty-Seven… LET’S DANCE!